Instant downloads of all 941 LitChart PDFs. You can also download the entire Shakespeare's Sonnets translation as a PDF! Thine eyes I love, and they, as pitying me, Knowing thy heart torment me with disdain, Have put on black, and loving mourners be, Looking with pretty ruth upon my pain; And truly, not the morning sun of heav'n Better becomes the gray cheeks of the east, Nor that full star that ushers in the ev'n Doth half that glory to the sober west, As those two mourning eyes become thy face. O let it then as well beseem thy heart To mourn for me, since mourning doth thee grace, And suit thy pity like in every part. Then will I swear beauty herself is black, And all they foul that thy complexion lack. As those two mourning eyes look on your face. And mourning dress suits your pity in every way. And anyone who doesn't have your complexion is foul. Kim, Suzy. "Shakespeare's Sonnets Translation." LitCharts. LitCharts LLC, 11 May 2014. Web. 18 Apr 2019. Kim, Suzy. "Shakespeare's Sonnets Translation." LitCharts LLC, May 11, 2014. Retrieved April 18, 2019. https://www.litcharts.com/shakescleare/shakespeare-translations/sonnets. 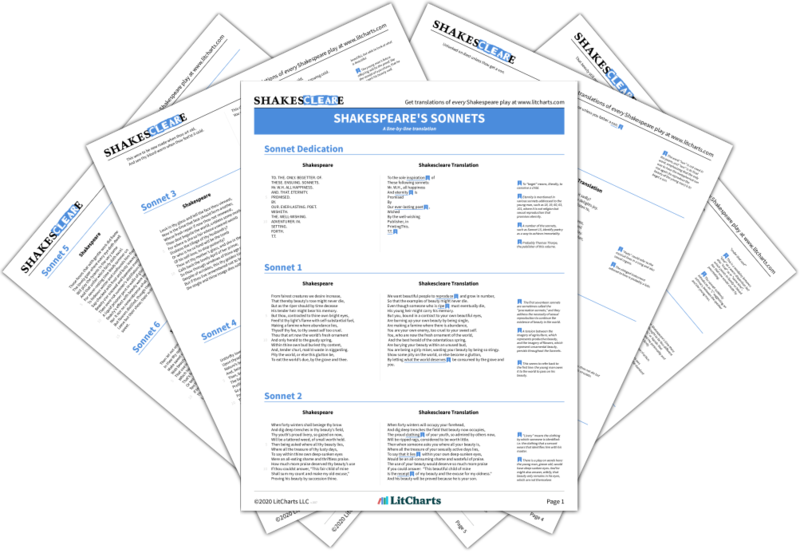 Join LitCharts A+ and get the entire Shakespeare's Sonnets Translation as a printable PDF. Suzy Kim is a graduate student studying Victorian literature at Brown University. She studied English and Psychology at University of Pennsylvania, and some of her creative work can be found in the upcoming volume of The Graphic Canon: Tales of Crime and Mystery Vol. 1. She is from Seoul, and currently lives in Providence, Rhode Island. Teacher Editions with classroom activities for all 941 titles we cover.